Have you ever shopped a yard sale, estate sale, or flea market in your hometown and wondered about the history behind the pieces you bring home? You might come across a retro lamp or a vintage metal locker basket...but imagine stumbling upon a package of skeleton keys and knowing there's a possibility that your purchase may have once unlocked a centuries old wardrobe or chest that held a wedding trousseau. Or maybe they opened a door in one of the many majestic castles that dot the European landscape. One of my sponsors is hosting a Giveaway today that offers you a bit of mysterious history--it's up to you to imagine the possibilities! 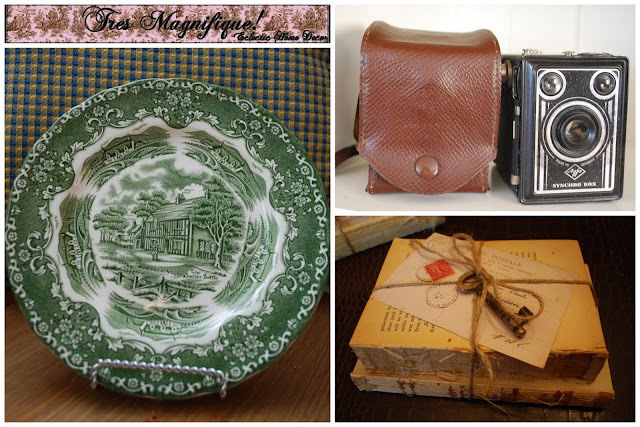 Tres Magnifique is an Etsy shop featuring items specially selected from European flea markets! Mom in High Heels (MIHH--her real name is hard to pronounce! ), who has a blog of the same name and lives in Germany, opened Tres Magnifique in 2009. The shop is named for a French cafe she enjoyed during her college years, and most of her pieces are finds from her flea market shopping trips in France and Germany! As a blogger, MIHH sees the home decor trends around the blogosphere and shops for similar items, as well as pieces she'd want to see displayed in her own home. MIHH is able to keep her shop prices low because antiques are so plentiful in Europe , ranging in time periods from "modern to ridiculously old." Most items are shipped within 48-72 hours of the purchase date. 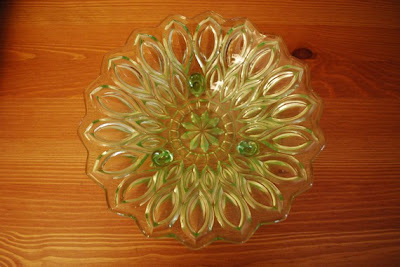 I'm a huge fan of her Depression style glass dishes. Check out the intricate designs! MIHH prefers the stylish vintage book bundles, which would make the perfect addition to an any-time-of-year vignette. 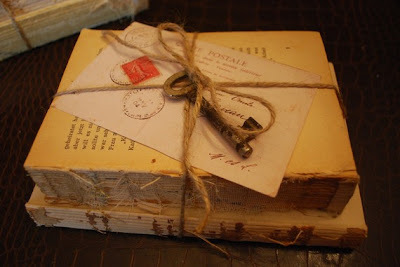 Each is topped with a vintage European skeleton key and a reproduction French postcard. Lovely! She also added some of her own creations to Tres Magnifique...check out the detail work on those goose eggs! 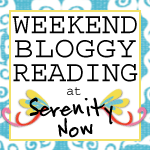 This week, the Tres Magnifique shop is hosting a Giveaway for one Serenity Now reader! You can win your own set of vintage European skeleton keys! They range in size from 3" to 4 1/2" in height, and have not been polished in order to retain their natural aged look! 1. (mandatory to enter) Visit Tres Magnifique and leave me a comment with the name of your favorite item. 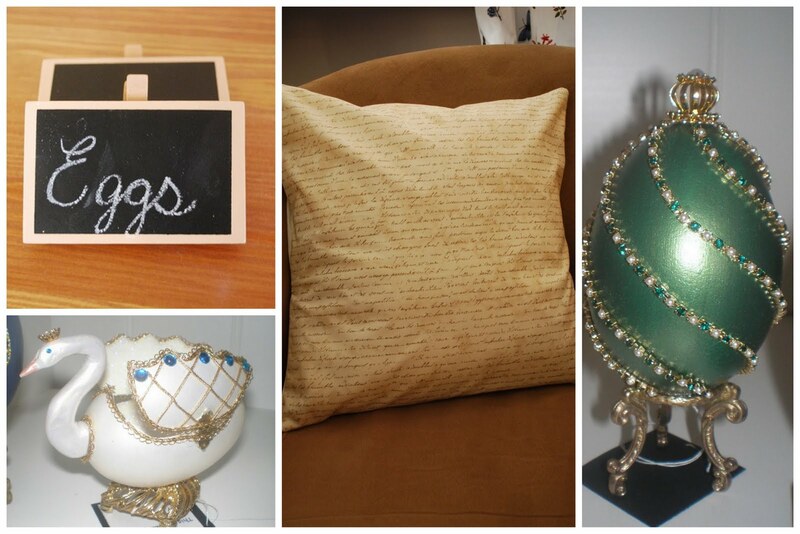 I love it all from the champange corks to the teapots but my fav has to be the french script pillow :-) Thanks for hosting the giveaway Amanda! I like the vintage camera box. Nice little display piece. Thanks for hosting! Those keys are awesome! I love the Vintage AGFA Box Camera with Case too! Such a fun piece! Thanks for the giveaway Amanda! 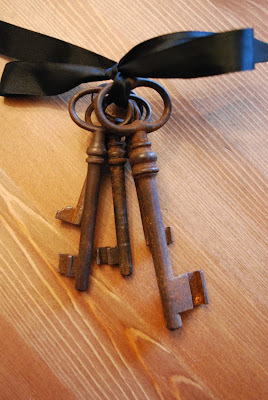 I really do love the vintage skeleton keys! And the green German beer bottles and the depression glass and the ironstone tea cup set. She has fabulous items! Love those keys! I also really like the vintage camera! Oh, the red transferware. So pretty. And those antique spoons are pretty cool too! I love the skeleton keys, but a close second would be the vintage Parisian postcard. Love it! What a great store! 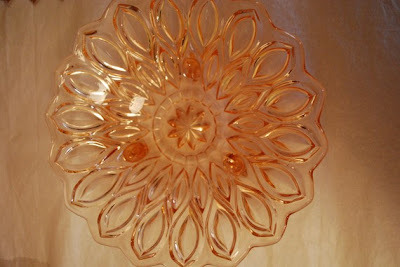 I love the "Pink Depression Glass dish". The pink depression glass bowl is so pretty! Has to be my favorite...although everything she finds is so nice. What a great eye! I love the Staffordshire Transferware plate in green!!! I love the French Script pillow cover! If I could find some fabric with french script I could so make one of those!!! Please enter me in to win those keys, they're awesome! I love the skeleton keys and the apothecary jars she has. I really like the British Anchor transferware blue and white coffee pot with lid, it is so beautiful!! Actually, the keys are my favorite, and I would love to win! When I was a child, we lived in an old house for a few years and the locks had never been changed...we had a real working skeleton key! I am in love with the French script pillow cover! All of her items are magnificent!! Thanks for the chance to win these beautifully aged keys!! I love the Red English Ironstone Tea Cups, saucers, sugar and creamer. The skeleton keys are also super cool! I love these keys!!! That would be my favorite thing on her site. 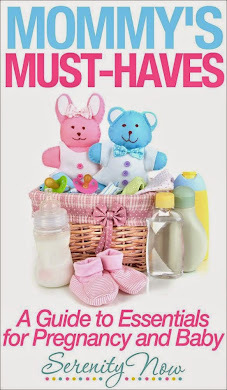 There are lots of great items. I am totally into keys right now! My favorites are the (5) skeleton keys. The keys are actually my fave... Thanks for the giveaway!